I suspect that once the cold weather starts in December, it will get blocked and stay. Rapid global cooling due to the sun going into a half-century slumber. Time to be concerned, especially as we're wasting billions trying to bring on the cooling. I have concerns about this damaging crop growth and we have no plan for this. Could we start growing more food in Africa and the Sahara desert to compensate. I am sure there is a way that the Sahara desert could be changed so that trees could be grown and food produced to compensate for the loss of Rain forests. When is this rapid global cooling going to start? No sign of it yet, despite years of predictions. Don't suppose there is ever a good time to be flooded, but this must be a complete nightmare for all of those washed out of their homes. Cold weather coming which will no doubt hamper repairs and all this in the run up to Christmas - just dreadful. Good luck to all. Way back in 1972/3 Prof H Lamb (UEA) identified a change from general zonal flow pattern over UK/NA to a more meridional type. His contention was that the UK would experience an increasing number of prolonged spells of 'type' and that rainfall might be copious when it was wet and not as mobile as perhaps we were then used to. This is more or less how it has turned out and has manifest in the way we have prolonged dry followed by prolonged wet - alas more of the latter (but benefit with less cold winters since the late 60s). There have, of course, been many notable flooding occasions in the UK but during the last 15 to 30 years slow moving/stagnant upper troughs (UK/NA) have intensified the rainfall effect particularly if uk is on forward side of diff. trough (hence why the much mentioned prevailing jet is pushed further south). Looks like the current upper-trough will be around for some days yet but with subtle shifts allowing colder air into the UK/NW Europe. It is infrequent these days to hear the words "mobile westerly" as a precursor to a forecast - a phrase much employed by HV Foord (Bert), Graham Parker and Jack Scott! "Unprecedented for the last 21 years" is what I heard about the flooding in Wales! This week's "Countryfile" has an item about the "Great Storm" of 1703. It was shown at 18:40 on Sunday but is repeated again next Sunday at 12:20. It is also currently available on iPlayer. So colder weather on its way. Well we are getting towards winter. The previous week's rain was not unprecedented. In 1912 a sudden storm over East Anglia dropped 8ins of rain in 24 hours. Very little flooding of property because then we were not stupid enough to build on flood plain. Building rules were relaxed in the 1980's and since then flood plain buildings have flooded as expected. "we're wasting billions trying to bring on the cooling." We are spending Trillions upon Trillions in releasing heat trapping gasses and particles in the atmosphere. "New one to me – the MO has issued a “Heat Health Watch”:-"
Evidently a mistake - it was soon removed. Probably should have been the "cold weather alert". "Evidently a mistake - it was soon removed." try and "dredge" up any oddity they can find. The point is that these high rainfall events are becoming more numerous and widespread. For instance the tragic events in St Asaph today. The river has exceeded the record level by about 1 metre, a record set only a mere 3 years ago. Well young Mr Hudson - I drop in here about once or twice a year to see how you are doing. I read your articles more often but don't comment. It gives me a good chuckle reading the comments. I see you have the same group of warmists - (well it has warmed I suppose - well not for 15 years or so -but you know what I mean) trying to push water uphill as always. The "All time" record ice minimum in August - since that was only 30 years, and eventually it was admitted that the massive Arctic storm in the first week of August broke-up a huge area of ice - attributed to melting by some gullible numpties at the BBC (not you Paul), and since it is now wayback up towards the average again - I think we can assume a relaxed view. Of course it was splashed all over the MSM that last March Arctic sea ice was above the 30 years average - oh it wasn't, I wonder why? Hurricane Sandy is due to CAGW. - Well even the IPCC doesn't think you can prove that and since much worse storms occurred in the past it is just the usual activists jumping on a unsupported wagon. As it approached the east coast of the USA it just made it into category 1, but nowhere recorded hurricane force winds overland. Of course it occurred with a high spring tide and the storm surge was 3 to 4 metres. The damage and loss of life was devastating, but hardly unprecedented. The Cat 3 Hurricane known as the Long Island Express had a similar central pressure - that was in 1938. Three cat 3 Hurricanes occurred in 1954/5 within 12 months in the New York area and storms (from sedimentary records) with greater than 3 metre surge occurred with there greatest frequency in the 17th century. When people have to make to ridiculous claims in this way - they have ceased to do science and moved to religious activism. Ironically the 17th century (thought to have the most frequent hurricane/storms in the last 700 years in the USA) was one of the coldest centuries in the last 10,000 years - so warming causes more storms? - jury is well out on that. Since colder poles probably means a greater contrast with the tropics - that should lead to stronger winds and........ I don't no, it's a complex topic. Some of your commenters can just hold to their beliefs - I will just keep an open mind and review the evidence. I see John_Cogger taking PingoSan to task over the idea of global cooling. Well maybe Pingo is stating it a little boldly, but there are many good scientist who believe that the Sun is a much bigger driver of our climate than the plant food is and solar activity has been decreasing - so we live in interesting times. I have no idea whether the planet will cool,, but again I will keep an open mind. BUT let me just remind you that in the last 1 million years 90% has been ice age - In the last 100,000 years nearly 90% has been ice age. The current interglacial (known as the Holocene) is about 11,000 years old. According to ice core records the warmest period in the Holocene was about 8,000 years ago and the 17th century was almost as cold as a period about 8,500 years ago. see the ice core temps here. 1. During the last ice age CO2 levels fell to about 180ppm (currently close to 400ppm) in the unfrozen tropical regions. Research experiments show that at 150ppm and below nothing grows = little to eat. 2. Best estimates suggest that at the start of the Holocene there were approx 1 million souls on Earth. 3. All of our expansion as a species to our technological level and 7billion people has taken place in the Holocene because of warmth and abundant plant growth. 4. Cold and low CO2 would kill billions. I don't know what is going to happen, but there is little evidence for AGW and even less for CAGW and the real challenge to life on Earth will come when the Ice Age returns - as they say, it always has done in the past. And we are currently at longer than many interglacials. "The point is that these high rainfall events are becoming more numerous and widespread. " What is your source of data to support that statement? "Yes but it is unclear how much development and tarmacing is to blame"
Not sure if you intend that as a sarcastic comment or not. The fact is that there are many variables involved in flooding events, as opposed to actual rainfall amounts. Even the Environment Agency accept that changes in land use are a major factor in any change in flooding events. Additional houses, roads, supermarkets and other urban development cause water to enter the drainage system and eventually the rivers, much more quickly than was previously the case. It is virtually impossible to compare flooding situations today with those 50 or 100 years ago. I went out walking on Sunday at Lindrick Dale. Somebody recently bought an house with a lake used to serve a water wheel, they had removed the sluice and put two pipes in, to let the water flow into the lower lake. The top Lake had overflowed and caused a big river down the track, which was actually quite dangerous. It had also caused flooding further back on the river serving the lake. How many other people do stupid things like this, with far bigger consequences. I have no sympathy with people who buy houses on flood planes. WHICH would be a travesty if you were referring to your hard earned tax dollars being squandered on oil and gas extracton and refining etc. Personally Id prefer private companies to continue to invest their investors money and profits from sales in extracting more of that black gold etc instead of my tax dollars being p1ssed away on windmills and mirrors and any other number of Mann Made Global Warming (tm) rubbish. 10: can't understand it . CO2 levels were so low then there can't possibly have been enough latent heat energy to cause such a storm. This morning there is a call from the Planning Minister, Nick Boles, to build on more open land, in order to "solve the housing problem". No doubt this would solve the problem for a while, but the inevitable consequence of the continually rising U.K. population, a large part of which is caused by immigration, is that eventually, most of the country will be built on in order to provide housing. Eventually there will be little countryside accessible to the majority of the population. Also, Mr Boles doesn't seem to understand the relationship between such housing development and the increase in urban flooding which is currently taking place. If we build on more fields, then there will be nowhere for the water to go apart from down the drains and straight into the rivers. "I see you have the same group of warmists - (well it has warmed I suppose - well not for 15 years or so -but you know what I mean) trying to push water uphill as always." On what basis are you claiming there has been no warming for 15 years? "The "All time" record ice minimum in August - since that was only 30 years, and eventually it was admitted that the massive Arctic storm in the first week of August broke-up a huge area of ice"
The storm didn't cause the record low. The ice was already at record low levels before the storm and continued to decline sharply after the storm. There have also been storms like that in the Arctic before in the past without it getting that low. The record low is better explained by the reduction in thickness of the Arctic sea ice over the last few decades, including since 2007. "and since it is now wayback up towards the average again - I think we can assume a relaxed view." Skeptic blogs took the same view when ice went up towards average in the winter following the old 2007 record, which is why they didn't see the 2012 record coming. It would be wise to learn from their mistake and not imagine that average levels of ice in winter mean summer records aren't going to keep coming (or winter records for that matter). Ice extent reaching average in winter is not even a sign of recovery. An average implies that ice used to be as much above the average line as below it. If it's now below the average line 95% of the time apart from a 5% short spell in winter then it's lower than it used to be. "Of course it was splashed all over the MSM that last March Arctic sea ice was above the 30 years average - oh it wasn't, I wonder why?" Because it wasn't news. Reaching average for only a few weeks in the year, rather than a full 6 months each year, is a sign of arctic ice decline, not recovery. A better sign was the record minimum, which was reported by the MSM. "Hurricane Sandy is due to CAGW. - Well even the IPCC doesn't think you can prove that"
But does the IPCC think the hurricane is unrelated to CAGW? I am surprised you think the IPCC not agreeing with a claim is a sign the claim is invalid. "Note that despite all the hysteria about warming, we are even now at the coldest end of the Holocene. Some points are relevant (IMHO)"
That record doesn't include the recent warming. Current temperatures are near the top end of the graph. I dont have the time unlike I suspect some people have here to research reams of data. But I would cite the following very noteworthy high rainfall events in the last few years I can think of. We'll discount Boscobel August 2004 as that would fit in with the East Anglia 1912, Lynton/Lynmouth 1952, Martinstown (? ), Dorset 1955 very localised type events. But the 2007 - June events that hit sheffield and Hull and the July event where the Cotswold catchment area received 5-6 inches in 36 hours; November 2009 where the Lake district received those phenomenal 24 hour totals enough to drown the Derwentwater islands as well as affecting North Wales. November 2010 I believe South West England was badly affected. Then 18 months of below average rainfall then the remarkable run these 8 months. to examine the global hydrological scale then look globally qv but I suspect the insurance firms have already done the analysis and come up with the unpalatable truth. Hence the petition to governments last week. As for being alarmist I make no apology. CO2 in the air and in the oceans hasn't probably been as high as this for a million years (ice cores suggest this) and the planet is responding. I strongly suspect for instance that the entire Greenland ice cap is going to start to undergo annual and periodic melting this decade. If it does then the projected metre rise in sea level will be hopelessly inadequate. There is always the possibility of jokers in the pack but as a consortium of insurance companies and banks have concluded we are on course for a catastrophic warming at some stage. How do you ''trap heat'' in the atmosphere? Heat trapping is impossible, 2nd Law of Thermodynamics violation, so how do you? Heat trapping is a myth politically imposed to transfer money to third world countries. Heat trapping is a consequence of the GHE which is impossible, because it violates the 2nd Law. 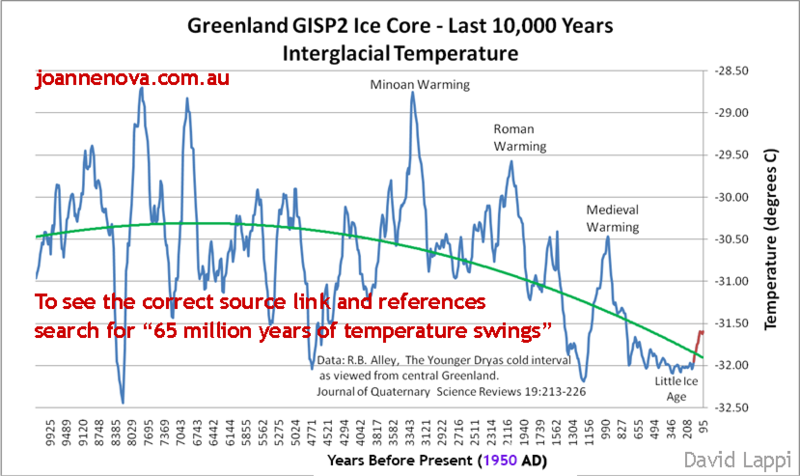 See www.climateofsophistry.com for a complete explanation. the 2nd law doesn't say you can't trap heat. By heat trapping he means the same way a dam traps water. Building a dam across a river (adding CO2) will cause the river level (temperature level) to rise behind the dam until the water (temperature) reaches a higher point where balance is restored. I think Piers has gone for a mild start to December? "The Daily Mail have gone with a similar story -"
I believe that is the third paper with essentially the same headline, and yet there is nothing in the body of the article to substantiate the claim. The nearest they come to that is the prediction of temperatures as low as -20c in "some locations" in December and January, but that is probably of every winter. Which locations and what about February? The people writing these articles seem to have been fed the same info on which the headlines are based but I doubt if they really know what they are talking about. I think they get confused/deliberately mix the forecast temps and the forecast 'feels like' temps? The problem is that it is becoming difficult to contact these people, because they hide their e-mail addresses. All it does is demonstrate the inability of the MSM churnos to produce anything other than sensationalism. Cut and paste comes far too easy, especially as it might sell some chip wrappers, keeps the editor happy. No longer any room for investigatory journalists, also I wonder if there are any left capable of a full on investigation. #28 Quake. read the law again since you seem not to understand the term entropy. Your enalogy is wrong. The only way to increase heat in a system is to introduce more heat from outside the system. Your dam is getting more water from upstream, ir, outside the dam system. No system can get more heat from inside itself- violation of both 1st and 2nd laws. So heat cannot be trapped it has to escape. Even insulation does not trap heat only slows heat loss. Your duvet keeps you warm in bed but the bed system is getting new heat introduced from your metabolism without that new heat your bed temperature would rapidly fall to ambient. "State of global temperatures in 2012"
"28 November 2012 — This year is on course to be the ninth warmest on record, according to the World Meteorological Organization (WMO)"
"Using information to October from three leading global temperature datasets, including HadCRUT4 compiled by the Met Office and the University of East Anglia, the WMO say the current 2012 global average temperature is 14.45 °C. This is 0.45 ± 0.10 °C above the 1961-1990 average. Taking into account the range of uncertainty in observing global surface temperature, scientists from the Met Office suggest that 2012 is very likely to be between the 4th and 14th warmest year in a record dating back to 1850." covered specialist and non-specialist science content on TV, radio and online and science was defined to include not just natural sciences but also coverage of technology, medicine and the environment relating to the work of scientists. In it response to publication of the review, in 2011, the Trust welcomed the clear finding that BBC science coverage was generally of a very high quality. Nonetheless, the Trust was concerned about the deficiencies in coverage that Professor Jones and the content analysts had identified. On the application of due impartiality, the Trust agreed with Professor Jones that, “there should be no attempt to give equal weight to opinion and to evidence” and that a “false balance” (to use Professor Jones’ term) between well established fact and opinion must be avoided". Its only mention of climate I can find is on page 8 under ‘Due weight’ which suggests issues of divided opinion should be covered by scientific perspectives instead of pro and anti positions. Sounds like the right way to me. "The only way to increase heat in a system is to introduce more heat from outside the system"
The bed duvet analogy is a fair if your body heat is that of the planet giving off IR after already being heated by visible light from the Sun and the duvet is gradually getting thicker and thicker. Less and less heat will escape even if the heat reflected remains constant.
' Odd, then, that, as in Wallace's day, so many should dispute the facts of science and expend their energies in abusing those who attempt to extend them (the internet with its legions of bloggers had not, of course, then been invented). Wallace was described as a "pitiful dastard… a swindler and impostor, a coward and a liar" and several newspapers published virulent pieces on the supposed dishonesty of the scientific establishment and its unwillingness to allow debate on such a contentious issue. Absolutely well suited for the job, part of the Team, sign him up. "The only way to increase heat in a system is to introduce more heat from outside the system. Your dam is getting more water from upstream, ir, outside the dam system." As Lazarus pointed out the "river" in this case is the stream of energy coming from the Sun. Elevated GHGs are the dam. Energy (water) builds up behind the dam until water level (temperature) is high enough to pass over the dam. Afterwards there is still as much water (energy) flowing downstream (into space) as there was before the dam (GHGs) was added, but now the water level (temperature) behind the dam is higher. folks - the analogies are going nowhere. I suggest you call it quits before it gets embarrassing. I should know, I've embarrassed myself a couple of times trying to find a suitable one. "It is scary to note the limitation in our understanding of the impact of current 0.8 per cent mean global temperature increase with the sudden disappearance of the Greenland’s ice sheet in four days in July this year — a picture which some thought resulted from an error in satellite monitoring." Presumably he believes that it also reappeared again after four days. Probably a bad analogy but one put to me by none other than Dr Roy Spencer but his skew was that a cold person getting into bed would get heat from the duvet which is wrong since the duvet, without any energy input like an electric blanket, would be at ambient temperature. So he was wrong as well. Atmospheres reduce incoming energy because all composing gasses will remove heat to get warmer themselves (1st law of thermodynamics), GHG's react, adsorb, more than non GHG's in this respect. If the GHE was correct then there would be a temperature anomaly in the mid to high troposphere but there is not by any measure. But if it was there would this anomaly actually cause a temperature rise at the warmer surface, as the GHG theory states. NO because the 2nd law prohibits heat flow from cold to hot to increase the hot temperature. Try holding a mirror up near a candle flame. The flame will not get hotter because of this re-radiated heat. The GHG theory also claims that heat is radiated from the surface but the major heat loss method from the surface is convection not radiation. radiation comes from the cloud tops. No clouds and daytime temperatures will be governed by solar radiation, permitting temperatures warmer than on cloudy days, clear nighttime temperatures will plummet. Try 24 hours in a desert, daytime 50C night minus 10C. Desert air very low in moisture, no convective cloud, though convection vigorous as flying fairly low over a desert will demonstrate. Despite peer reviewed papers claiming that the sun has no effect on climate, it is the GHE, even common sense shows that the sun is a major contributor and since climate is heat driven, then it is the only heat source available so THE driver. All other inputs are minor in comparison. Again if (?) the GHE worked and given the fact that energy travels at the speed of light then any cutoff of energy to the troposphere, high level cloud for instance, would immediately cut off the GHE. "The GHG theory also claims that heat is radiated from the surface but the major heat loss method from the surface is convection not radiation." The major heat loss method is radiation. At about 15 degrees C solid objects give off about 400wm-2, mainly as infrared radiation. That's more than the surface absorbs on average from the Sun. Still no sign of a mediterranean climate becoming the norm here in the UK then? ".... even common sense shows that the sun is a major contributor and since climate is heat driven, then it is the only heat source available so THE driver. All other inputs are minor in comparison." No one is disputing that the Sun is the major influence on earth's surface temperature. What they're saying, and what's been demonstrated for nearly two centuries now, is that the amount of radiation energy coming from the Sun intercepted by the earth is simply not sufficient to produce the temperatures observed at earth's surface. Earth's surface is about +33C warmer than it should be if it were relying on direct solar energy alone. Greenhouse gases act like a dam wall (per quake's analogy above). If the rates of water flowing into and out of the dam are constant, the water level in the dam will not rise or fall. So even though water is constantly flowing into and out of the dam, the water level remains in a 'steady state'. But say the outlet of the dam becomes even partially blocked, the water level of the dam will slowly rise (because more water is temporarily flowing in than out). When the blockage clears equal rates of flow into and out of the dam are restored, but the water level has changed. It has reached a new 'steady state', slightly higher than it was before the blockage. The Sun's radiation is the constant 'inflow' to earth's energy system. The 'outflow' is longwave radiation emitted from the surface to space. Adding further GHGs to the atmosphere temporarily reduces the outflow of heat energy, raising the heat energy level of the oceans and atmosphere (and melting ice) until equilibrium is restored, only with higher heat levels in the 'energy dam' of the oceans and atmosphere. "Current alert level: Level 3 - Cold Weather Action"
After gathering all the evidence and noting the content my advice is. The ebb and flow of the discussion on GHG/HadCRUT'n' et al is, at times quite entertaining but not really relevant to current thread which (imho) referred to the change from wet weather to something drier and colder here in the UK. It appears to me that those who argue that GHGs are accelerating global climate change encounter difficulty in convincing those who do not take that view - who in turn are bombarded with sometimes spurious data to undermine their opinion that they do not. One thing is for sure, whatever weather phenomenon is observed here, now and in the immediate future (which is tangible and does affect us all) in this little piece of land at the north eastern edge of the Atlantic cannot be relied upon to indicate any global climate change. Has anyone considered calculating the effect on the wider climate of the use of all the military ordnance etc used since say around 1900? Sorry - just a thought. No kidding here. I'm 59 and never seen this before. Yesterday (29th), I looked into a clearish sky from Dalton, Huddersfield and to the left of the sun there was a triangular shaped cloud which had the colours of the rainbow on its vertical edge and within that cloud it also looked like there was another sun which was obscured. Whatever combination of things caused this appearance, it looked like there were two suns - amazing. I do not drink or take drugs!! This is no wind up and I wondered if it was all a trick of the conditions. Stunning. Did anyone else see it? I understand that UKIP are highly sceptical that global warming is man made, another reason for me voting for them. pedro - try googling fata morgana. Might be this. ??????? I would be interesting to see the background for that, or is this something that is that far out there that I shouldn't get involved! Unfortunately analogies are the only way to explain concepts to people without the standard of scientific literacy required to grasp basic physics. JM for example appears to have little understanding of Spectrography so we must resort to dams and blankets, but even the simplicity of such analogies seem un-graspable in their case. "...it looked like there were two suns - amazing." "Unfortunately analogies are the only way to explain concepts to people without the standard of scientific literacy required to grasp basic physics." Wow how utterly patronising is this - it is a disgraceful and unnecessary comment and reflects the problem with the 'debate'. The scientific world has hardly covered itself in glory in recent years and on a whole range of issues (not limited to climate change) have been quick to produce 'reports' into this that and the other (remember the mmr debacle and consequences) a great many of which are simply desk-top reviews of previous work. So don't wonder for too long why the 'warmists' find difficulty persuading sceptics. Perhaps some 'scientists' don't possess the basic level of communication literacy! "Rapid global cooling due to the sun going into a half-century slumber. Time to be concerned, especially as we're wasting billions trying to bring on the cooling." Increasing greenhouse gases in the atmosphere have easily offset any reduction that may have resulted from reduced solar radiation over that period. What makes you think they won't continue to do so in future? Furthermore, if we're on the cusp of a new mini ice age, then someone needs to let the polar ice caps know. A major new study published in the journal 'Science' this week concludes that between 1992 and 2011 the Greenland ice sheet lost mass at an average rate of ~142 gigatonnes (one Gt is a billion tonnes) per year. That does not take the massive losses seen in 2012 into account. All this in a period of declining solar output. "The scientific world has hardly covered itself in glory in recent years and on a whole range of issues ... (remember the mmr debacle and consequences)..."
The MMR controversy was the result of a single highly controversial paper published in 1998 in a blaze of media publicity. The conclusions of the paper were thoroughly investigated and rejected by the scientific consensus at the time. It mattered not one whit to the popular press, who kept regurgitating the (as it turned out discredited) claims made in the 1998 paper. By contrast, AGW theory is supported by multiple lines of evidence published in thousands of articles in the peer reviewed literature. These papers have become so commonplace that they are barely mentioned in the media (this week's Science article on polar ice sheet decline being an exception). However it seems that every single article published by 'sceptics' is heralded by the majority of the popular press in the UK and US, backed up by an army of bloggers and sympathetic media outlets in the US especially, as "the final nail in the coffin" for AGW theory. Note, this applies as much to the many articles published by unqualified journalists in popular press or blogs as it does to the few and diminishing peer reviewed articles published by 'sceptical' scientists. So while there is certainly an analogy to be made between the "MMR debacle" and the popular perception of the climate science "debate", it is not, I suspect, the one you are suggesting. At one stage it was suggested that land could be more resilient to flooding by using "mimimal tillage", which as far as I was concerned is counter-intuitive. Clearly this subject is not as simple as it might first appear. newdwr54, I couldn't have put it better. Not to mention a 2004 investigation by Sunday Times reporter Brian Deer identified undisclosed financial conflicts of interest on Wakefield's part. Would it be disingenuous to suggest parallels between that and scientists Like Soon an d Singer? #49 newdwr54. GHE demonstrated for centuries???? No. There are no properly peer reviewed papers claiming this. All that has been demonstrated is that LIR is received at the surface. It is assumed to be from the GHE but that assumption is flawed. We must expect to receive energy in the LIR spectra since these are within the emission spectra of both CO2 and H2O. The quantity will depend mainly on the volume of water vapour simply because there is more of it than CO2. There is no accurate measure of the water vapour atmospheric profile so simply registering a radiation fact without knowing any other parameter is useless. The radiation falling on the earth is treated by the GHG theory very simply and not even realistically. It is the two plate model. But the earth rotates every 24 hours. It radiates, from the cloud tops, in every direction at 240w/m2 but receives radiation at 480w/m2 because only half the planet receives radiation so to comply with the law of conservation of energy this must be double that lost. Doubling the received energy ensures that the surface gets warm enough and is not stuck at -15C or whatever temperature the alarmists have come up with. If surface heat loss was by radiation alone how do you all account for the convective cloud that daily forms. Deserts nighttime heat loss is by radiation because the skies are clear and the air dry so temperatures plummet. When the air contains water vapour extra time is needed for the extra heat, as latent heat, to escape giving warmer nights. The 12 hours without sunlight is not enough to loose all heat. You have also to factor in compressive adiabatic heating which climate models and the GHG theory ignore. You also have to apply the laws of thermodynamics and the GHE violates the 2nd law. Simple experiment shows that the effect cannot happen. Arrhenius was not right about everything. Thanks newdwr54. I googled sun dog images and it looked like the far right image on page 21 but with an obscured 'sun' within the cloud. Not an expert on what's in the sky but will be much more interested in future after that experience. All that has been demonstrated is that LIR is received at the surface. Incoming solar radiation has been measured by satellites for well over 30 years. Regardless of clouds and water vapour, we know how much is entering the atmosphere, how much is received at the surface and how much escapes back into space for decades now. We also know that the amount leaving has reduced with increasing GHGs and global temperatures over the years. This is a major fingerprint that supports AWG. "#49 newdwr54. GHE demonstrated for centuries???? No. There are no properly peer reviewed papers claiming this. All that has been demonstrated is that LIR is received at the surface. It is assumed to be from the GHE but that assumption is flawed." Total solar energy intercepted by earth has been calculated theoretically for well over a century and is now confirmed quantitatively by satellites. There is not sufficient energy from the Sun to maintain earth's observed average surface temperature. The temperatures of the surface and the atmosphere cannot be treated as one complete system. They are two separate systems. 52% of the power absorbed by the surface is heat re-radiated from the atmosphere by greenhouse gases; 48% is direct from solar radiation. The atmosphere absorbs only 20% of direct solar radiation, but it absorbs 90% of the surface's infrared radiation (which it then re-radiates in all directions, including downward). So by absorbing and effectively re-cycling heat energy between the atmosphere and the surface, it is greenhouse gases that contribute the 'missing' 33C to observed surface temperature. And no one said there was no such thing as convection. About 21% of absorbed surface heat is released as convection and latent heat; it's this portion that creates clouds and causes weather. Thanks. For comparison, HadCRUT3 is currently (end Oct) +0.41 for 2012. If the AQUA satellite ch.5 has been accurately re-calibrated during its recent down time, then November 2012 looks like it will keep up the exceptionally high global temperatures seen over the past seven months. In that case, the upper end of the 'neutralists'/ lower end of 'warmest' predictions look most likely. If I were to bet on it, I'd pick +0.42 (Mr Bluesky and Lazarus) with +0.43 John Cogger as a hedger. I'd be suprised if I was the closest as my guess was based on the idea we would have a boost from an El Nino. So to be anywhere near close without one is surprising. My 0.41 was also based on a weak el nino forming by now. "My 0.41 was also based on a weak el nino forming by now." Not quite yet but Llantrisant is on standby. No vacancies, ready to go! No El Nino was recorded in 2012, not even a weak one. Temperatures have to be +0.5C above average for 3 months in ENSO region 3.4 before El Nino conditions are officially declared. From the data, the longest continuous period above +0.5C in 3.4 was 10 weeks, so no El Nino. However the official La Nina cooling persisted until mid February. "Temperatures have to be +0.5C above average for 3 months in ENSO region 3.4 before El Nino conditions are officially declared." "Your chart doesn't show ENSO 3.4, which can be found here: https://www.bom.gov.au/climate/enso/indices.shtml"
Yes it does, just look you will find. Be careful Aussies being Aussies headline "Index" and then state "Temperature". Enso 3.4 sea surface temps have been positive for the last 10 months, just actual observational data. No spin, no interpretation, just an absolute actual fact! An El Nino is called by the opinion of a homo sapien on an arbitrary homo sapien metric. But the actual metric, sea surface temperature, which is the way that energy is released into the atmosphere that we treasure the measurement of, has, without any question been positive for the last 10 months. Simple, plain, absolute fact. The only way El Nino can have an effect upon GAT is to produce warmer than average water temperatures, it has, simples? or do you think that pressure differentials are more important than temperature? In which case you move into the realm of the "sky dragons" and I bid you good bye! Taking the Australian ENSO 3.4 region data over the past two years, and averaging each running 7 month (30 week) period, I find that La Nina conditions ended in July 2011 but remained "neutral" but negative SSTs; La Nina conditions set in again in January 2011 and became neutral but negative SSTs again in May 2012 (this was the so-called "double dip" La Nina). Actual SSTs in ENSO 3.4 remained negative until late April 2012 and have been steadily positive since late May. As far as the running 7 month average is concerned, "neutral" conditions have continued steadily since early June 2012. The running 7 month average has not, as yet, risen above +0.5C in 2012, though it is on the verge of doing so (currently +0.46C). You may have a different definition for La Nina/El Nino? If so, then we are once again talking at cross purposes. "...La Nina conditions set in again in January 2012 [not '2011'] and became neutral but negative SSTs again in May 2012..."
It doesn't often happen, I must admit, but I agree with what newdwr54 has just stated. It must be Christmas I feel all of a glow. I have said that LIR is measured at the surface and it is expected. It is within the emission spectra of both CO2 and water vapour but most from the water vapour which is not measured and needs to be. Yes we know the incoming radiation but that only falls onto half the planet. Since the outgoing radiation is 240w/m2, from the whole planet, we have to have double that to comply with 1st law of thermodynamics. IF there is any more heating of so called GHG's by outgoing radiation then any falling back onto the surface will not raise the surface temperature because that radiation is from a cooler area, the mid to upper troposphere. To do so would violate the 2nd law of thermodynamics. The GHG theory ignores the fact that the planet is a globe and that it rotates. The planetary atmosphere does not act like gas in a glass vessel but is actually held to the planet's surface by gravity it has no top or sides only a bottom, the planet's surface. Any theory that is formulated must reflect reality and this is missing in the GHE/GHG theory. Another fact ignored is the effect of gravity on the atmosphere. It causes heating and is the cause of the adiabatic lapse rate or is that now a contentious issue. Try www.climateofsophistry.com written by a Canadian astrophysicist. @ DW, 78 & 79. Thanks for the data, SST's positive in April not Feb, no worries I was only eyeballing from the BOM chart. SST's, the major part of the ENSO Index, have been positive for most of the year, which your data confirms. That shows positive ENSO 3.4 SST's starting in April 2012, ENSO 3 went positive in March and ENSO 4 in May. I am not linking to or talking about the SOI Index, only the SST Index, see link above. ENSO 3.4 SST has been positive since May, not negative, peaked at +0.96C in August, went down to +0.12C at the beginning of November and is now back as you correctly state at +0.46C. UKP, many thanks for the link, don’t get me wrong I am decrying Doug Cotton and the theories. I have watched them develop over the years but to date any discussions have always been protracted and always end without a resolution, as with many other theories, solar, LWR, DWR, clouds, cosmic rays and many, many, more. That is why I try very hard to stick with the actual observational data. AGW theory is that temperatures will increase in proportion to the level of CO2 in the atmosphere. My question is simple, is it doing what it says on the tin? The above are HadCRUT4 as at Oct 2012. Whilst the 30 year trend is at present significantly positive, if the 10 year and 15 year trends remain significantly below the 30 year trend it can only reduce. Is it doing what it says on the tin? Don’t know yet, only time will tell, but keep your eye on the shorter term trends because they will dictate the long term future of the 30 year trend. If they go above the 30 year trend then it will increase, if they stay below it will reduce. There will be short term ups and downs from the past data but they will not affect the long term trend. The 30 year rate of warming has been reducing for 9 years, whilst the level of CO2 in the atmosphere has continued to increase. As for Enso, it is an indicator of SST trending, there needs to be a period of three months continuous temperatures in the 3.4 region either above 0.5C or below -0.5C of the average before they declare a state other than neutral. Page 20 of this report, released weekly on a Monday, explains it better. "follow the comments through and also at:"
Thanks UKP, will do later, just been told that family are visiting en masse, somebody must want something. Re ENSO, yup know about the declaration constraints. That was not my point. Just because we are not in the designation does not mean that the actual temps have not been above average, they have been for the majority of the year. If above average temps during an El Nino event can effect global temperature why can't above average temps in the area now have an effect? I don't think it only works when we give it a name. That is just a designation of magnitude. I see what you mean now, I suppose it boils down to the amount of difference away from average. The upwelling of warm/cold water from the western/eastern Pacific associated with major Enso events is of a magnitude that connects atmospherically on a regional basis, possibly also feeding back, which probably enhances the effect on global temperatures. Minor changes from the average don't change the atmosphere to the same extent and are probably limited to a regional basis rather than global. The whole subject should probably warrant greater study. I was interested to see on this week's edition of QIXL, that it is possible for Australian motorists to offset their annual CO2 emissions by paying a company to shoot some of the camels which are now wild in the continent, because the camels themselves emit methane. I think it said that 6 camels was equivalent to 1 year's CO2 emissions for the average motorist. Stephen Fry suggested that it was unfair in the camels and that instead, perhaps the emissions of the camels could be offset by shooting motorists. Thanks for that. More light reading! "If the AQUA satellite ch.5 has been accurately re-calibrated during its recent down time, then November 2012 looks like it will keep up the exceptionally high global temperatures seen over the past seven months. " RSS seems high relative to UAH, not sure why. "AGW theory is that temperatures will increase in proportion to the level of CO2 in the atmosphere. My question is simple, is it doing what it says on the tin?" I thought that after a certain point, water vapour played an increasingly significant role. greensand: "If above average temps during an El Nino event can effect global temperature why can't above average temps in the area now have an effect? I don't think it only works when we give it a name. That is just a designation of magnitude." you are right, there has been a warming effect from the positive ENSO. It might not be officially an El Nino but it was sort of close. That is not what the BOM chart of Sea Surface Temperatures shows:-"
That's the rolling 30 week (seven month) average. By the Wiki definition, El Nino is declared if the average SST in ENSO 3.4 are 'on average' +0.5C over 7-9 months. The rolling 30 week average does not follow the weekly changes in actual SSTs. While SSTs have been above average for the past seven months, no 7 month period has been above +0.5C on average, so no El Nino has been declared. That might change tomorrow though, because a high SST in 3.4 might tip the rolling seven month average above +0.5C for the first time in 2012. No, a gross over simplification on my behalf, but as the theories about the role that water vapour has are at present beyond me, I try to stick to the observational temperature data. "Sea Surface Temperature", not the 30 day SOI. You get there through:- “ENSO Monitoring Graphs” with the heading "Weekly data to 25 Nov 2012." With regard to ENSO events, everybody knows that an El Nino had not been declared. That was not the point, it was, and quake now agrees, that the ENSO 3.4 SST’s had been above average for the majority of the year. Thanks quake, but I have to admit I have no idea how to quantify any effect it might have had. It's not a 30 day average GS, it's a seven month average, which is (roughly) 30 weeks (bcause the ENSO data comes weekly). I got it from the SST definition of ENSO per the wiki page. See #78 above. I added a running 30 week average to the last two years' data. If the running average was +0.5 then it was designated 'El Nino'. Everything else was 'neutral'. That's my understanding of the SST system for La Nina/El Nino classification per the Wiki article. There's no doubt that SSTs have been continuously positive in ENSO 3.4 since late May. However, global temperatures began to pick up as soon as the weekly SSTs rose above -0.5, back into ENSO neutral conditions. UAH registered its first positive anomaly back in March, when SSTs in ENSO 3.4 were still negative. April, May, and most of June were all below the +0.5C threshold in the weekly data, yet all the global data sets published strong warming. So my main point is that all ENSO 3.4 SSTs have to do for global temperatures to rise, it seems, is to enter neutral conditions. Only La Nina conditions now seem to be strong enough to temporarily slow the warming. If El Nino conditions do eventually kick in, then obviously you'd expect to see that reflected in even warmer global temperatures over the next few months. we're probably back to the changing ENSO baseline again to explain why current ENSO fluctuations cannot be easily compared with those of 10 years ago. I imagine that if the baseline had not been changed, then the current neutral but positive ssts, would appear as a strongish El Nino over the old baseline. Similarly, the recent la nina probably wouldn't have made it into negative territory at all. It makes sense (to me at least) that since neutral is now essentially 0.2 above the previous neutral, we should expect greater ocean heat transfer to atmosphere even with relatively neutral conditions. It will be interesting to see where the next neutral baseline will sit. I think it is due to change in 2014. On a related note, (and probably stupid) but does anyone know if the Walker circulation picks up any of the antarctic sea ice melt and then transports it via humboldt current toward the central pacific?